Martin Eckert is pleased to offer a scholarship contest to students entering post-secondary education. Proceeds from our events are used to ensure that our Scholarship Fund can continue to deliver support to the students who need our help in realizing their dream of a higher education. Scholarship is open to graduating students entering their first year of studies at an accredited University or Community College. 1) This scholarship is for students in their final year of an Ontario secondary school who are pursuing post-secondary education after graduation, for example, college, university or a trade school. Students must currently reside in the province of Ontario and be registered with a secondary school within the province. Applicants must also be a Canadian citizen or have been given permanent resident status. 2) Applications must be submitted via email at martinmeckert@gmail.com or mailed to the following address and postmarked on or before 11:59 p.m. on Friday, August 23, 2019: Martin Eckert, 4242 Dundas St West, Toronto, ON M8X 1Y6. 3) Applicants must have a record of academic achievement and possess a range of leadership qualities and community involvement. Describe something you have done in your community. -The bibliography and/or footnotes (these are not included in the word count). -A detailed resume outlining their academic achievements, work experience, volunteer work, and extracurricular activities. -Brief letters of reference (including current contact information for each reference). - A photocopy of proof of acceptance to a post-secondary institution(s). -Duplicate and incomplete submissions will not be considered. - All answers must be submitted in English. - Only 1 scholarship award recipient will be contacted via telephone before August 30, 2019 concerning the status of their application. All other applicants will be contacted via email after August 30, 2019. - A scholarship award of $1,000.00 will be paid to recipient prior to the start of the first semester of postsecondary studies. 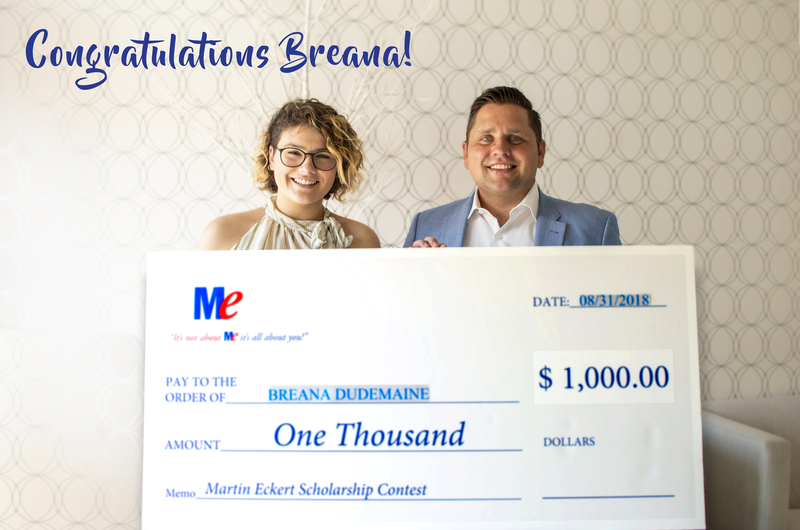 CONGRATULATIONS TO BREANA DUDEMAINE FOR winning the 2018 MARTIN ECKERT SCHOLARSHIP contest! WE WISH Her ALL THE BEST!!! Congratulations to Michael Imbrogno for being awarded the Martin Eckert Scholarship 2017. We wish him all the best!! !